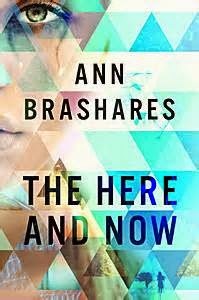 The Here and Now, by Ann Brashares (Delacorte Press, YA, April 2014). It is a bad future. Messed up climate. Plauges. Scarcity. Death from plagues. Hopelessness....But no, there is hope! With the help of newly perfected time travel, the future can be ameliorated! Except that a whole bunch of time travelers arrive in our United States and don't actually want to mess anything up--they are too busy not being in the bad future. And to make sure that their comfy present isn't jeopardized, the leaders of the time travelers make it their priority to enforce Rules, in a nasty, private little dystopia way of their own. There are other time travelers. And not everyone wants one-way trip to the past to be just a staycation. Some want to change it. And one such man tells Prenna secrets she was never supposed to learn. What he tells her sends Prenna and Ethan fleeing from the time traveler community to try to save the future....and to enjoy as deeply as possible being together in the present they're about to try to change, for as long as they can. So although this might seem like Romance Time Travel, there's actually a lot more too it. It's also Stranger in a Strange Land time travel, and two people from different places trying to connect story, and young person questioning assumptions story, as well as two people falling in love and exploring all of that together, and it's really quite interesting once it all gets going. Not paradigm-shifting interesting of a deeply moving kind, but a good read. It is, however, not desperately fast to get going--I really truly didn't need to be told with quite so heavy a hand how Ethan understood Prenna. And the time travel paradoxes make me a bit nervous--Ethan and Prenna really do change time so that the future is different, which should mean Prenna not being Prenna....but sometimes, when reading travel, "whatever" is the best way to simply enjoy a good story. And it is not one I would give to the sci fi/speculative fiction fan; it's more one, I think, for the high school relationship fan who wants something with a bit of a twist (that doesn't involve vampires). It doesn't have the full on, gritty, really high stakes feel of a full-blown dystopia; it's more a story using speculative fiction elements to get to the relationship between the two main characters. To like the story, you have to like Prenna and Ethan, and kind of let the glimpses of the future and the action in the present just carry you along. So sort of a restful, escapist, romantic spec. fic. with dystopian elements, good for beach reading. I agree! It was just what I needed. I would display it with other time travel stories with bubbles that say romance and time travel or time travel with... Maybe some of the avid time travel reader would have fun discussing it. "...but sometimes, when reading travel, "whatever" is the best way to simply enjoy a good story." WHY do I get the feeling that this one isn't your favorite?? I'd heard of this one and not been especially interested by the premise--but this sounds a bit different than my impression so I may have to look into it after all. Especially since I just finished Brashares' My Name Is Memory and enjoyed that one a lot! >>sometimes, when reading travel, "whatever" is the best way to simply enjoy a good story. Ahahaha, this is awesome. It is awesome because it is a hundred percent true. Your last sentence, "So sort of a restful, escapist, romantic spec. fic. with dystopian elements, good for beach reading." is so spot-on. I liked this one too, but in a dreamy way. I'm not sure that came across in my review... you captured this one perfectly!